Easter’s coming, and with it one of the kids’ favorite holiday treats. The annual dying of eggs. Which means that at some point this week I will find myself in the grocery store buying several dozen large, white eggs. And I’ll be adding a few things of food coloring to the cart. I’ll probably need a new package of crayons, too. Thursday or Friday my kids will all be arguing with one another about who passed gas and accusations will be flying and met with various firm denials. Me? I’ll be in the kitchen laughing as I boil said eggs for their future Easter enjoyment, and not saying a word. One day, or maybe at some point that day, they will figure out that just like the fresh broccoli I love and steam so often, hard boiled eggs stink too. The pay off is so worth it though. While those eggs are sitting pretty in those colorful baskets Easter morning, by the next night– they’re lunch or dinner. The hubs takes them for breakfast and snacks. The sons’ grab them and go, tossing the peeled shells in the plants where they’ll eventually break down and act as a kind of recycled fertilizer. For myself though, I much prefer them ‘deviled’, especially at Easter dinner. The coloring always leaches through a little dying the whites gorgeous pastel shades of color. Topped with the creamy, bright yellow filling– they’re a fun, festive treat. It’s a great appetizer or side dish for gracing any family’s holiday table. But we all know how I love to experiment and take things above and beyond. My deviled eggs were no exception. 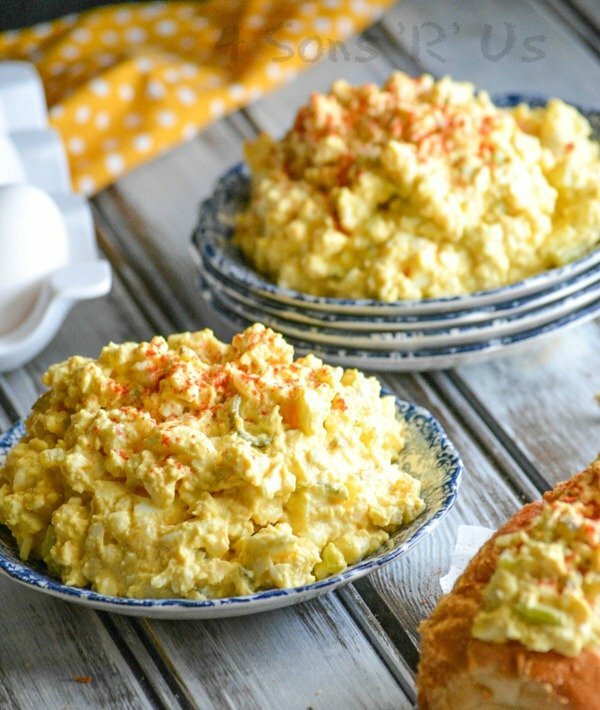 This time I decided to combine them with another of our favorite ways to enjoy hard-boiled eggs- egg salad. The result? 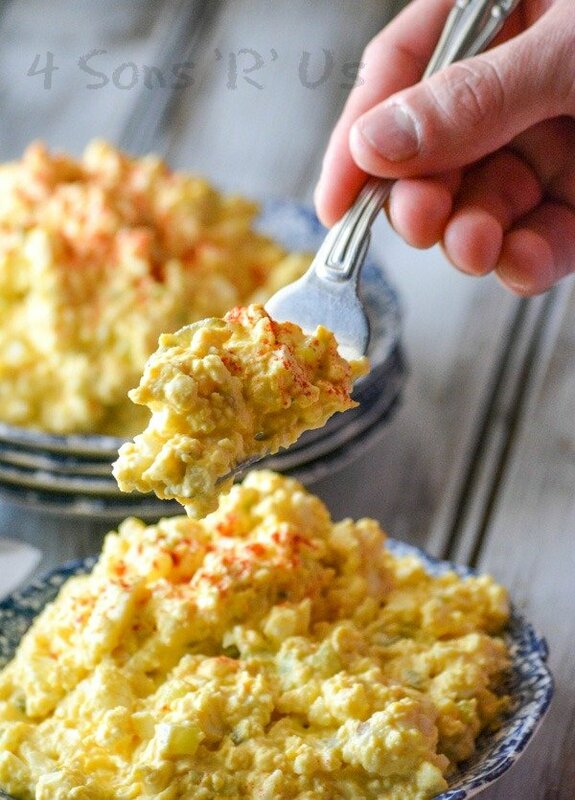 Deviled Egg Salad. And it didn’t disappoint. 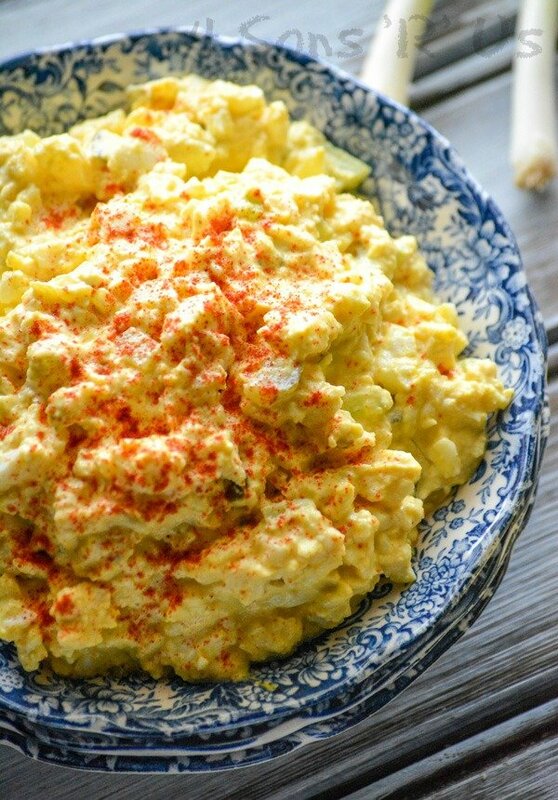 Instead of making deviled eggs with your hard-boiled eggs, opt for this Deviled Egg Salad instead. It’s creamy, perfectly seasoned, and topped with a sprinkle of smoked paprika for a pretty finish, that’s also quite tasty. Serve it as is with crackers, on a sandwich with toasted bread, or in a crisp lettuce wrap. Don’t miss out- make sure you check out our recipes for Crab Stuffed Deviled Eggs, French-Style Deviled Eggs, or even these fun Irish-inspired deviled eggs. 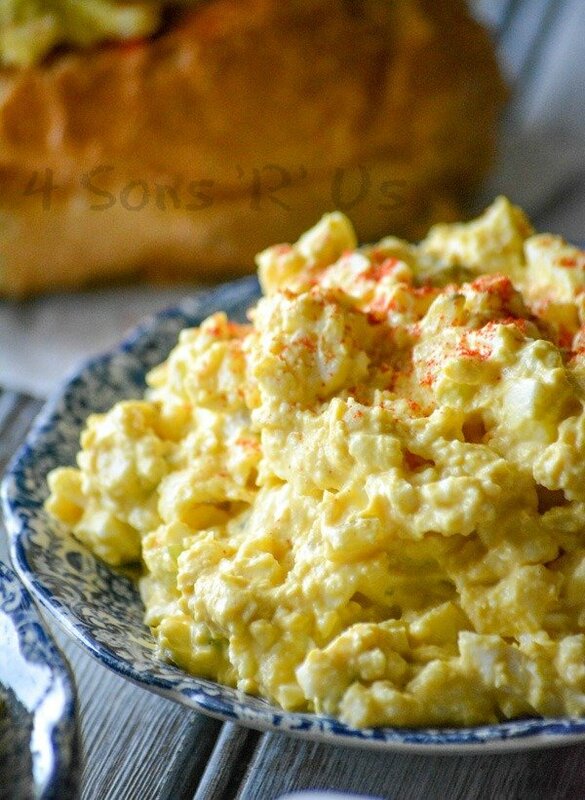 A creamy egg salad, it's easy to whip up and tastes just like your favorite party food. Add the eggs to a large mixing bowl. Use a potato masher to 'smash' them into tiny pieces. In a separate bowl, use a spatula to toss the onion, celery, relish, Worcestershire sauce, sugar, mustard, garlic powder, salt, and pepper together until evenly combined. Transfer the mixture to the bowl with the smashed eggs. Use a spatula to stir, until evenly combined and the mixture's smooth. Fold in the mayo, adding more or less to texture/taste, until the mixture's reached your desired creaminess. Serve this salad on sandwiches, with crackers, or even in lettuce wraps. Sprinkle it with smoked paprika before serving. I could eat the entire thing! 😀 I love egg salad and this one sounds really good! This was a really good recipe. I did not have celery, so used celery flakes. Next time I’ll either go with the real thing or do without. One note on the recipe – the ingredients list mayonnaise, but the recipe never mentions it. I kind of figured it out on my own :), but you might want to edit. I really did like the flavors together an will definitely make this again! Thanks, Terri. We LOVE the flavors. I didn’t even notice that– thanks for bringing it to my attention. I’ll take care of it. I’m glad I’m not the only one who eats this. I had several left over from Thanksgiving and I’m the only one who eats it so I just threw them together on crackers. Quick idea for lunch at work also. Only difference I only add the yellow mustard, sugar, and I have to use Miracle Whip. Sometimes I will add a pinch of vinegar if it tastes too sweet. This recipe is great. 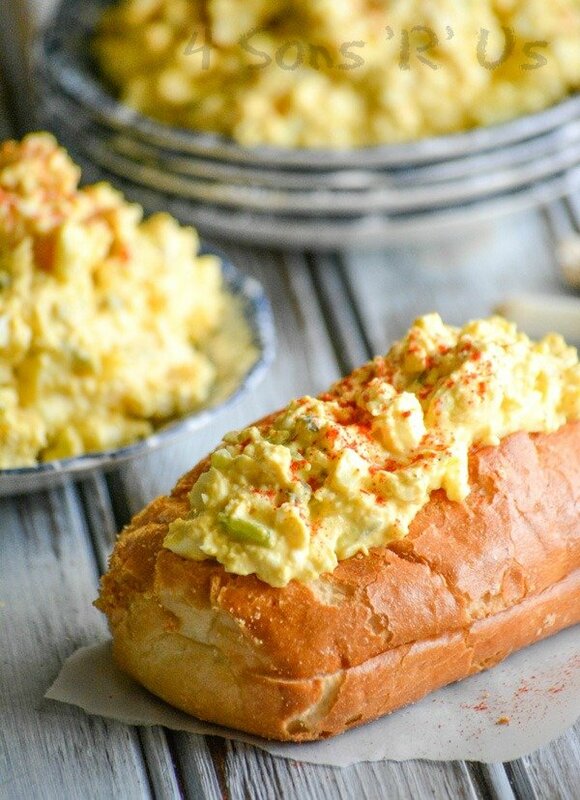 I don’t care for egg salad, but my husband likes it so I made this for him and I must say, I loved this myself! I use Duke’s mayonnaise and it was perfect, although I didn’t quite put all the listed mayo in it as to keep it thicker for sandwiches. Thanks for sharing this recipe! 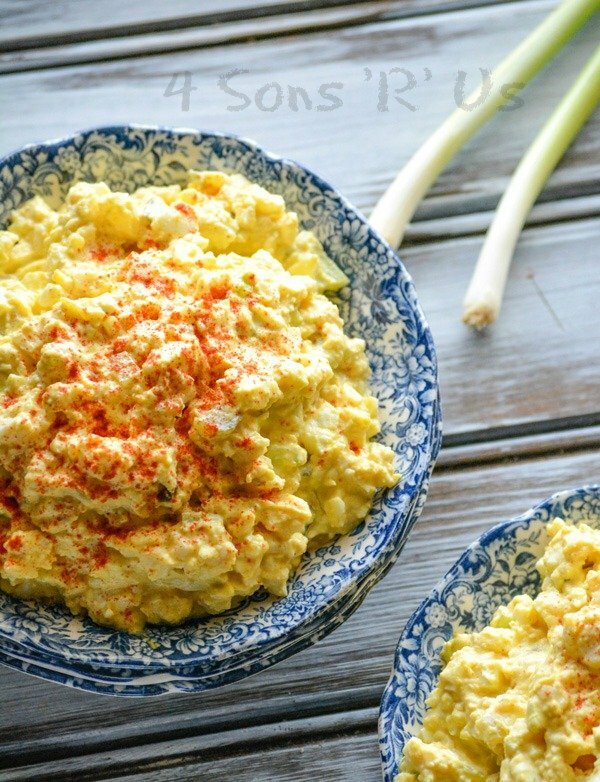 I never was a fan of egg salad until I met my husband- he loves the stuff too. This one though won me over too, and remains my go-to!